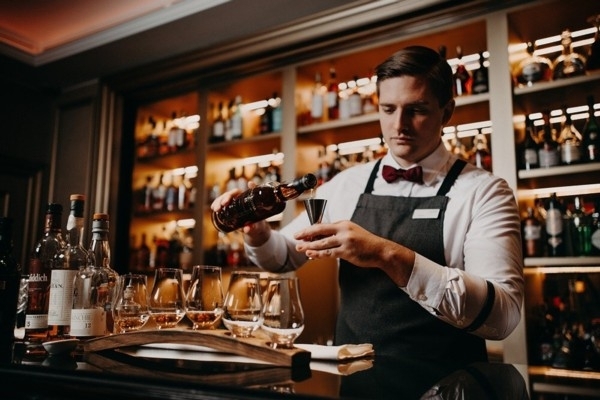 Riga, 26 March 2019, Grand Hotel Kempinski Riga's GRAND BAR and its head bartender Oskars Varenbergs have come up with the concept and created a rich whiskey library for sophisticated whisky gourmands in the city. The Grand Whisky Bar is the ideal place to start your adventure and discover a selection of American, Japanese, Irish or Scottish whiskies. "Whisky is an adventure, and the surroundings can change how you perceive the flavours in your glass. That's why this noble drink deserves the very best atmosphere," says Oskars Varenbergs, the soul of the Grand Bar. With over 100 open whisky bottles and a range of private tastings on offer, we have everything to satisfy your whisky needs. Whether you choose a whisky from our ever-expanding catalogue or indulge in one of our carefully selected tasting sets, the smooth jazz background, the bar snacks and the perfect glassware will enhance your experience. For the true whisky lovers, we offer to try one of our tasting sets accompanied with excellent service. Grand Bar whisky expert recommends these tasting sets which allow you to experience the differences and variety of flavours presents in each of the different whisky producing countries and regions – 5 different whisky serves of 1,5cl. With the famous Latvian National Opera House by its side and the Old Town, a UNESCO World Heritage Site, at its feet, the hotel presents a whole new level of comfort and elegance to both city guests and locals. Grand Hotel Kempinski Riga features 141 first-class rooms and suites, two gourmet restaurants and three bars, six spacious meeting rooms, including the Grand Ballroom, a world-class spa and a wellness facility, as well as an aromatic pastry shop right next to it. Offering breathtaking panoramic views of the capital, refined service and a rich cultural experience, the new hotel is set to become the place to be in the welcoming Riga city. About Kempinski: Created in 1897, Kempinski Hotels is Europe's oldest luxury hotel group. Kempinski's rich heritage of impeccable personal service and superb hospitality is complemented by the exclusivity and individuality of its properties. Kempinski now comprises a portfolio of 76 five-star hotels and residences in 34 countries and continues to add new properties in Europe, the Middle East, Africa and Asia. Each one reflects the strength and success of the Kempinski brand without losing sight of its heritage. The portfolio comprises historic landmark properties, award-winning urban lifestyle hotels, outstanding resorts, and prestigious residences. Each one imbues the quality guests have come to expect from Kempinski while embracing the cultural traditions of its location. Kempinski is a founding member of the Global Hotel Alliance (GHA), the world's largest alliance of independent hotel brands.